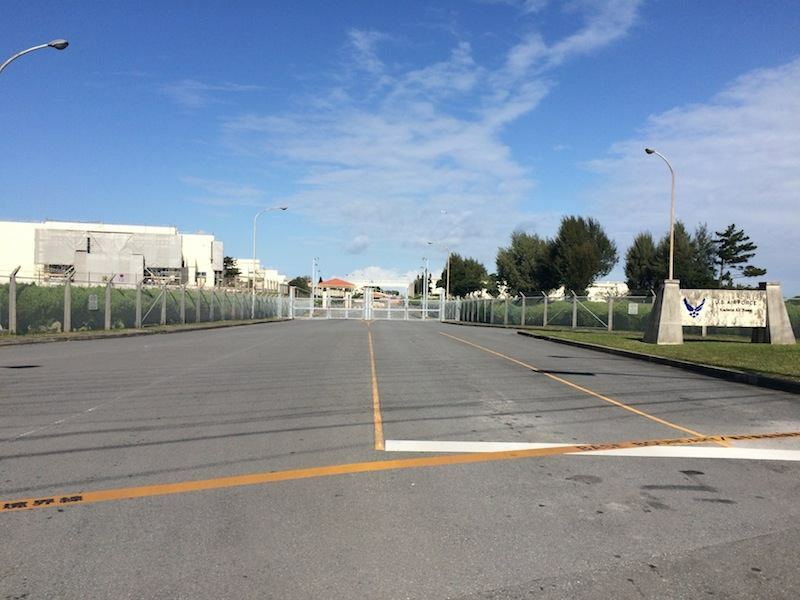 I grew up on Kadena Air Base on Okinawa, Japan. The base is still there, though I can’t enter because I no longer have any military affiliation. On the map, base land is blank space: no streets marked, no buildings. From satellite view, at least, I can see down into the base. But from so far up. The only way to get a closer look is to go there. Lately I am afraid of becoming more a consumer than anything else I am: a writer, a teacher, a citizen. The night before my flight, I’d gone to the mall for a drink with a friend. I live in Hong Kong, where malls tend toward luxury; I can’t afford what’s for sale there. It’s all Chloé and Dior and Piaget, names I’ve recognized for years from billboards and women’s magazines. I know my way around there, though, and I can see that the space is not made for the very wealthy. It’s made for me and people like me, not rich but willing to want, despite whatever qualms we have about capitalism or consuming. All its cream-colored marble and its smooth glass, its pumped-in floral scent, its gold watches and handbags and belts: more than any of the things themselves, I want to feel at home among them, want to walk through nonchalantly so that no one suspects I am uncomfortable. It almost works. Familiarity is nearly the same as ease. I’m closer now, at almost forty, than I’ve ever been to affording what’s behind the glass. My thinking of this means the mall’s logic is working on me. My plan is to walk all the way around the base. I’ve driven it before, last time I came to visit four years ago. I wanted to write a book about it and I did, but it wasn’t enough. What it means to me to have grown up here keeps getting more complicated. 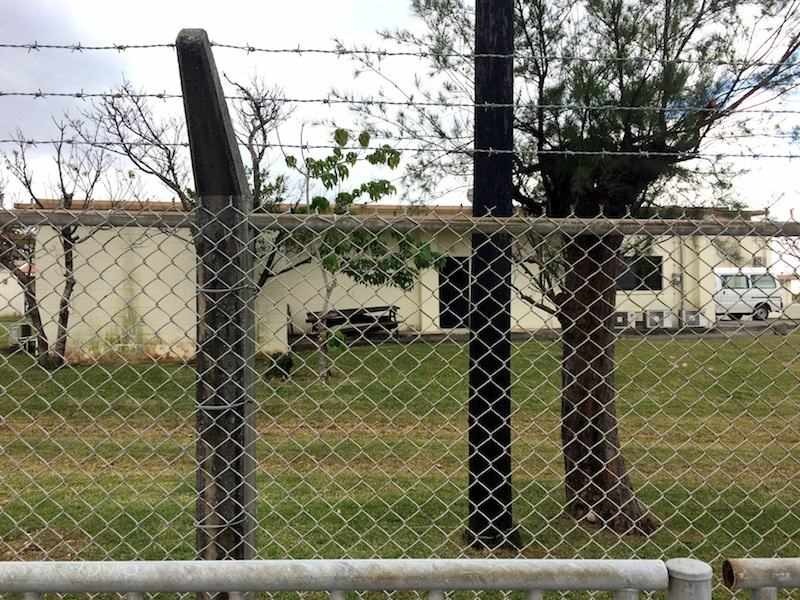 This time I am trying something simple: I want to find out what can and can’t be seen through the base’s fence. Or not so simple: I want to learn more than the base wants known, and I want to share it. I want to be threatening. Gate One, first gate, backed by the widest avenue, is as grand as any base gate gets: double-height gatehouse, complicated traffic lanes, sculpted sotetsu palm landscaping. What the gate guards is a golf course. I am reminded of my mall; the course, too, is designed to instruct in what’s desirable. Here, it’s American leisure, rolling fields of green on a scale that’s nonexistent off-base, where there are too many people on too little land for that. What a misuse of land, I think, and then, if it must be here, at least it should be screened from view. But what would I have the base replace it with, more airplane hangars, some proof that the land my nation’s military leases is put to military use instead of leisure? The base is a kind of business. For business you need golf. For the glamour of golf to work, you have to know it’s there; you have to make the green, green surplus clear. Through the chainlink’s diamond openings I see two men in slacks, their cart, a shot lined up. Neither of them looks out as I take their photo. Good morning, gentlemen, I do not say. A rusty wire snakes through the chainlink, stretching up to the fence’s barbed-wire crown where it ends in a knot around a barb. Perhaps the wire is here so that the fence can be electrified. Is it safe to put my hand through? I touch the fence and am not shocked. Of course not. It’s as though I’m waiting for sudden violence as evidence, waiting to be slapped back and reminded what the base is. But blank stasis is precisely what the base is. It’s been here seven decades; its damage is the opposite of shock. The golf grass spans the course and jumps the fence and highway to the strip of shoreline on the far side, climbing manmade fuel storage hills, the turf a thin coat over concrete, as smooth as the golf course and as green. The wind blows warm under thick clouds. Even on cold days it isn’t cold here. In high school we wore our letter jackets in this weather, the coolest of the year, December. We wanted mainstream American adolescence even though we didn’t live stateside, we had no malls, no concerts but the USO’s sad acts. We had, we thought, none of the things that would have made us normal. We bought our way in: jean shorts from Penney’s catalogues, class rings, jackets. And then hired off-base seamstresses to sew our letters on. I lettered in drama one year and had my picture taken by the vice principal, who led me to the auditorium and stood me by the curtains. Framed, my photo hung on the honors wall. Two years later that man fled, charged with touching students where he had no right to touch them and I thought of the auditorium’s darkness, black velvet curtains behind me soft, absorbing all the light that could be turned on me, on that stage, as he looked at my face through a lens. I wore the letter on my jacket, and a pin of the Greek theater masks. Black wool felt, gold cuffs, gold letter K the texture of carpet, sewn to my breast by a woman whose name I never asked. Not far from here is our first house off-base, whose neighborhood I barely knew. We stayed inside, behind windows whose curtains were shower curtains because, my mother said, she didn’t like the patterns of the Base Exchange’s proper ones. Or because we didn’t have the money for them. From that house, always, the planes. I hear the shifting roar behind me now on the flight line. I can’t see them but I hear them turning the whole sky like it’s on a spit. The sound comes into a house even with the windows closed. It’s not so bad, white noise like you can buy on tapes for babies who won’t sleep. But it also sounds like war. It’s one way war sounds. I held a candle in a vigil after 9/11 while Air Force jets screamed over us, the skies empty of commercial flights, and I thought Brooklyn finally sounds like home. I was a little proud to know that sound, and not scared yet of what those jets and others were about to do. Was not scared yet of what they had already done. My mother and I landed exactly where the soldiers had; our rented shower-curtained house was built on invasion ground. The beach south of our seawall was the beach in newsreels sent back in April 1945 when my mom was six months old, though neither of us knew it or bothered reading up. We never walked this neighborhood except to go for milk at our block’s corner store. In order to become part of an occupation, what kind of contract do you make with knowledge? I didn’t learn about who was killed where I stood, whose farms these were before I came. My mother didn’t, nor did my peers, nor hers. On this beach, once made of bodies, there’s no trace of the war except the invasion memorial, which is nearly hidden by landscaping. Everything has grown back around the baseball fields and vending machines and the cluster of apartments catering to soldiers, called things like Sea Dream VIII, with beach views and diving access off the seawall. I can see the last of them rising five stories high before the coastline turns in and the base takes over. There are some entrances the base has kept, but closed. The curb dips; there’s a driveway, the beginning of a road. But the gate is locked and the grass grows through the pavement underneath it. Inside is a three-foot-high concrete block in case the fence fails, in case it parts at the force of a car ramming in. Out here, on my side of the fence, are faded plastic water-filled barricades, red with warning. Two years ago I watched activists in Hong Kong empty barricades like these, to move them when news came that police were on their way with shields and gas. For weeks things had been calm, and everywhere was public space; you could walk beneath the underpass and say hello to other people walking, cleaning their tents, reading textbooks, folding paper into art. As I turned back from the barricades, I passed more people carrying water to refill them once they’d been moved to the front line in what was, after all, a kind of war, whose territory had been cleared from the city’s center. Where cars had been, there were no cars. At the concrete road dividers someone had built stairs, and someone else stood with her hand extended to help me climb them. I thought of New York in the weeks after the towers fell, the avenues emptied of traffic, the people walking down the center of the street, right through the lights. And in both cities, a flowering of multicolored paper tacked to every surface, and at every surface people standing together reading, having come to read the surfaces, having nowhere further to go. Before 9/11, the bases globally were drawing down. But then there was a new war, more than one new war. I wonder how old the water is in these barricades, how filled they are, if they would rock if I touched them. I don’t touch them. Just after the gate, there is an opening that can’t be closed: a gully, washed out, red rocks dry in the wide creekbed under the fence. In satellite view you can see the creek, winding through the base all the way back to Gate Two and the schools and the other gully where last year they found barrels tainted with Agent Orange chemicals. The runoff touches all the island’s water the way the wind touches all the fence’s holes and firmnesses. To see clearly, does it help to become a still point, to swing your gaze around, or is it better to become the moving thing, circling around the still point in the center? I move around the perimeter but I am more still than what circles around me: traffic, none of which watches long enough to see what I am doing, standing here in front of God and everybody as my mother would have said. 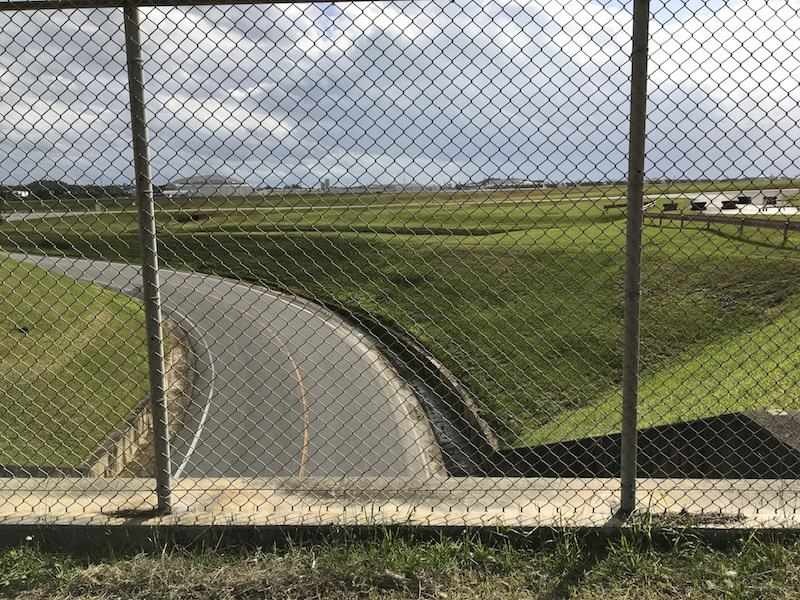 I used to circle inside the fence, driving the flight line road nightly with friends when we could drive nowhere but our own cul-de-sacs and to the Base Exchange and back, except for this road whose speed limit is the base’s highest: 50 kilometers per hour, which felt fast to us. We drove the loop over and over, five or six to a car. I recognize the reflective arrows screwed to the guardrail at its sharpest curve, where my rusty Nissan’s body used to scrape against its axles with the weight of bodies in the backseat. The flight line road meant a kind of freedom, and also privacy: a parking lot I made out in once, until the MPs shone flashlights into my boyfriend’s car. The abandoned dome-roofed water tower we slept in the night of prom. The most intimate moments of my adolescence happened in view of F-15s and Navy jets, a mere kilometer from nukes, on land secured by force, inside a fence. It’s Sunday, so Gate Four is closed. And, closed, looks less like a secured entry than a potential breach. The scene is anxious with prevention. Three kinds of barriers: the concrete blocks, the locked gate, the red plastic barricades. 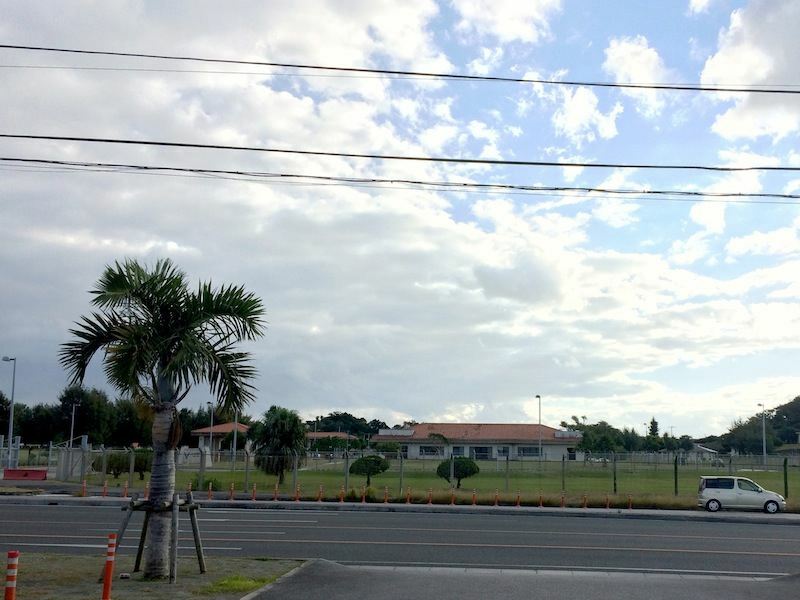 And further out, an orange line, and a sign explaining it: “This sign marks the boundary of Kadena Air Base property. Unauthorized personnel keep out by order of the installation commander.” If you are close enough to read it you are only feet away. In a car, it’s too late to stop instead of crossing, you’ve transgressed already, you are already guilty. As a pedestrian it’s easier to see where you belong. The crosswalk paint is faded but the orange line is crisp and bright. “BASE BOUNDARY / 嘉手納基地境界線” is hollowed out in knockout type. I look for the machine, the little dozer or heavy lifter which moves the concrete blocks so that the gate may open. I don’t see it. A teacher on base I spoke to told me there are protests at every gate now, every Friday. The orange line is new, and it’s there to keep protesters from the gate itself, from pressing too close to the cars on their way in. If you’re in one of those cars, you drive right over. Maybe you feel a little safer from the bodies who would prefer to block your way. The fence curves back out to the highway, and instead of a golf course there is a building labeled Maintenance. Against the building, no trees to block the view or tarp to neaten it, leans a stack of broken picnic tables, rotting. Rust stains and mildew track down the building’s wall and I wish someone would fix the tables, paint the building, coax some vines up between the fence and the visible neglect. I get this from my mother: keep your uglinesses private, your disrepair, clean your house before someone comes over. Am I a kind of patriot, to count the base’s ugliness enough like mine to feel shame when it’s exposed? Last time I visited, it wasn’t this that gave me pause. I was driving instead of walking and so I missed a lot of things. But I did make a point to stop at Jimmy’s Bakery, which my mom had loved, and I had loved, whose cakes were famous. I sat in the parking lot to eat because the patio was full. Looking across the highway at the base, I saw missiles stacked on crates just through the fence, long and olive-brown, stamped white with numbers. They might have been something else—just empty casings, or spare parts—but either way they had the same effect on me: visceral fear and a sense of unreality, as I sat peeling muffin paper from a purple sweet-potato muffin. Was it accidental, I wondered then, had someone just stopped thinking of the fence as something you could see through? Could throw a match through? What would happen if someone threw a match through? They aren’t there now, though there are crates shaped to hold them. There could be missiles in those crates, in the building behind the crates. There are almost surely missiles within yards of where I stand. The whole base is a missile, which is easy to forget when the missile’s body is made of grass and trash and mildewed buildings. Kadena Town does not forget. Its Town Office faces the fence a few yards later, and on it hangs a banner, three stories high: NO is stenciled at the bottom beneath a silhouette of the Osprey aircraft, the same red-and-yellow graphic the protesters held up at Gate One two days ago as I drove past, the same sign I held in 2012 in Ginowan. It was new to Okinawa then, the Marine Corps’ convertible helicopter-plane. I saw posters for days and then that day I parked my rental car and walked down to the park to join the protest, into thousands of people wearing red, distributing placards we could hold up. I still have mine. 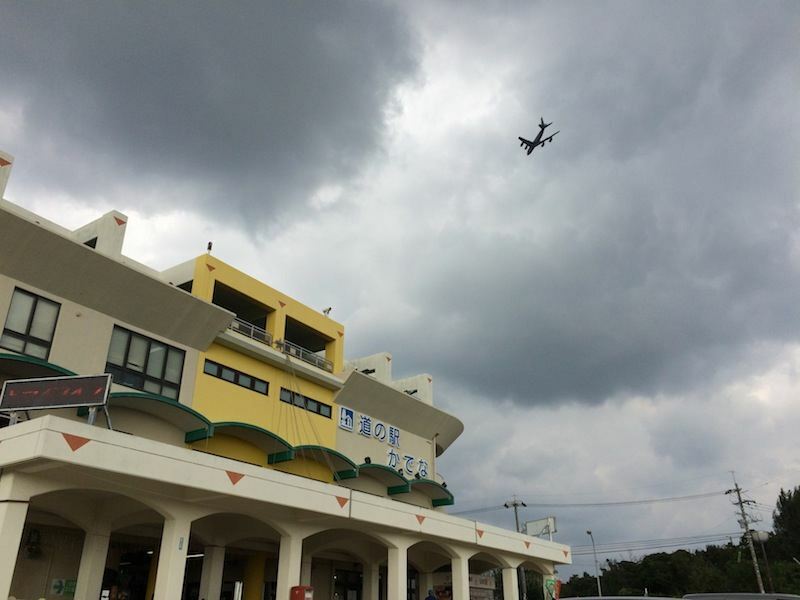 The base at Futenma still has the Osprey. 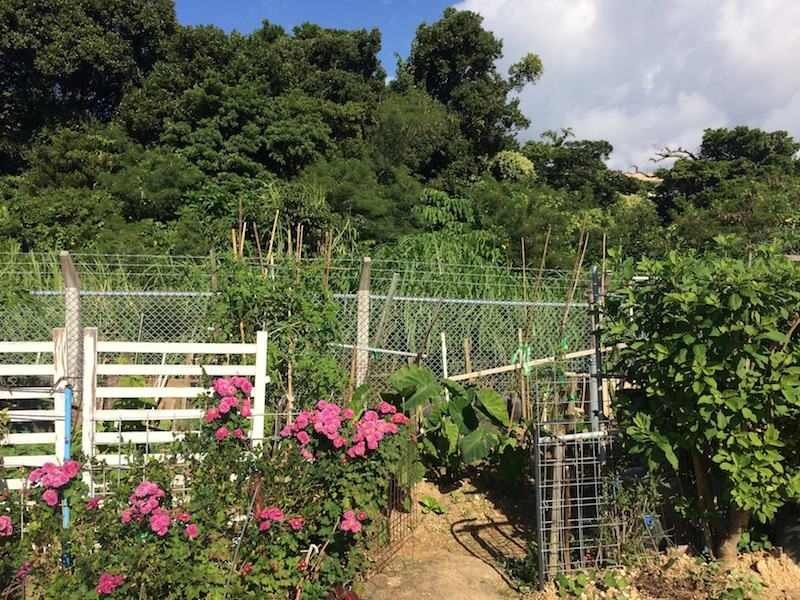 Just past the Town Office, the barbed-wire fence turns in to meet a wall and sprouts another fence to make a corner: a slim strip of gardens fills the unpaved land between the wall and highway. 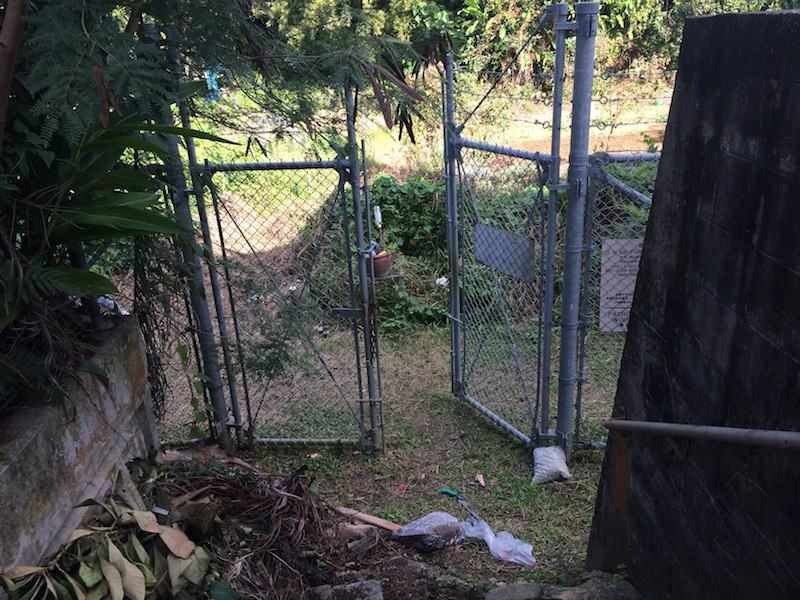 For a moment a blue tarp blocks my garden view, but then it opens to a flourish of bougainvillea and hibiscus and a chicken coop, full of crowing but grown over and roofed by corrugated metal. I can hear but cannot see the hens, like the engines, which are constant under the stadium lights on the other side of the wall. The base’s land is mostly leased. 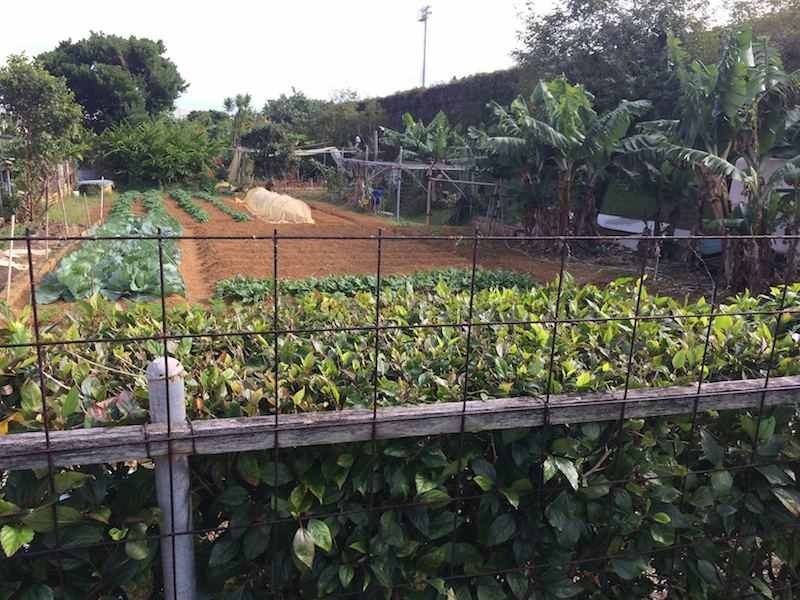 It still belongs to Okinawan landholders, who receive rent payments not from the US but from Japan, who then offers the land to the US for free. One struggle for the anti-base movement is this trilateral relationship: when people’s direct material interests are at risk it’s harder to rally them, especially when the money’s good, and Japan pays more than market rate. For decades, land rights were a core part of anti-base activism, but in 1972 when the US signed sovereignty of the island back over to Japan, the payments started. Land rights activism slowed until a decade later, when one landowner began what’s called the one-tsubo movement. 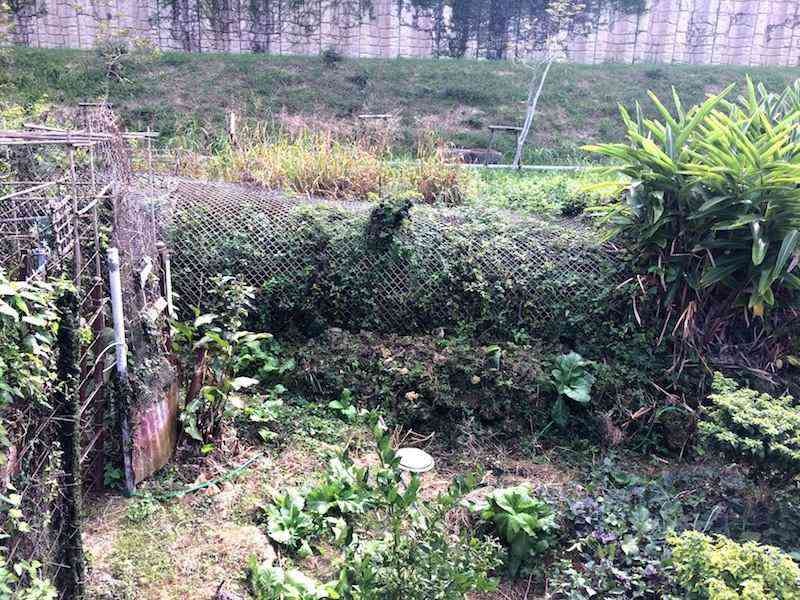 He sold parcels of land to other activists in the smallest unit possible: a tsubo is about 3 meters square. 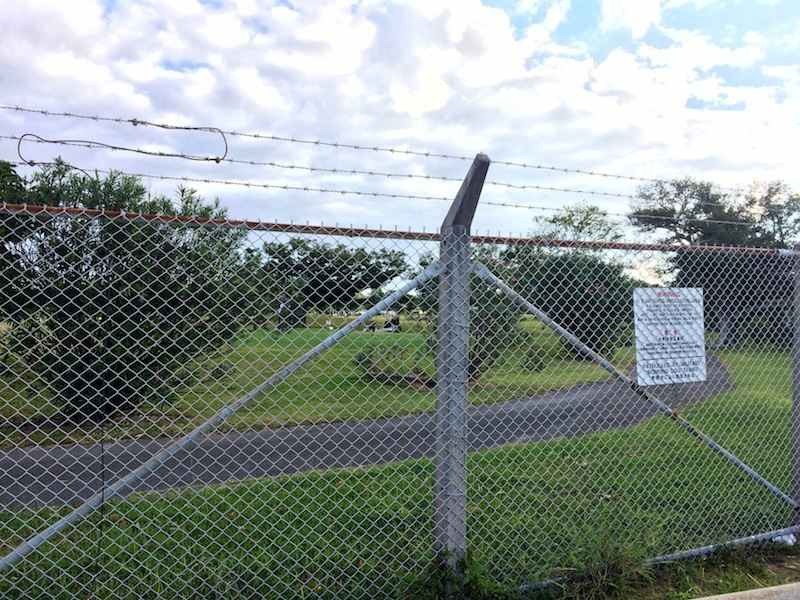 In a few years anti-base landowners numbered in the thousands, which helped shift the conversation from leasing fees to much broader land politics, to questions of communal inheritance and anti-military values. 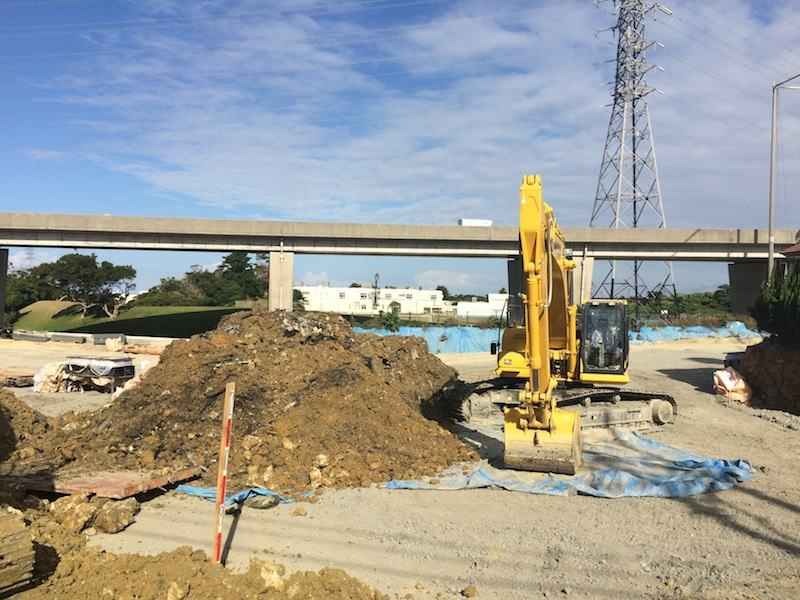 It’s still a muddy question, though—who owns this land, who uses it, what for, and who’s owed compensation. The base allows some land to be farmed, mostly in a ring at the periphery. Landowners can farm the plots, or sublet them to other farmers. It’s called “tacit farming,” a term which gets at the heart of how the fence embodies the power differential between the base and its surroundings. We will not say, but you can see. The vines work hard behind the farms, climbing the wall’s seams, and then suddenly they take over where there’s water, a ditch running along the wall’s base. And here the fence begins to suffer. It’s not kept up. It bends beneath the weight of what has not been trimmed from it, bends over backward toward the wall, tightened by the spring of flowering vines reaching for the water in the concrete ditch. A rat runs out. 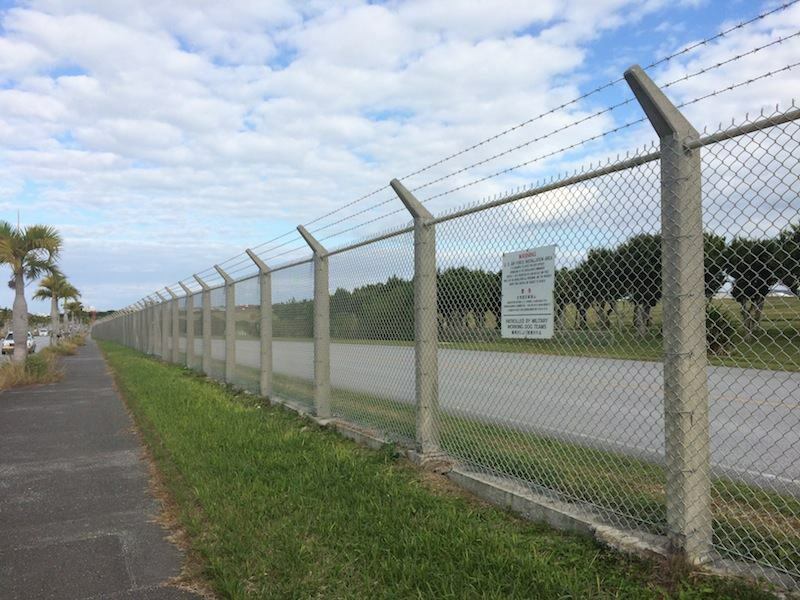 In front of the bent fence rises a new fence to take its place, a fence without barbed wire but with a sign guarding the garden: USAF Facility, it says. I can see a hangar over the wall and the wind is greasy with a steady smell of jet fuel. In the garden strip between the fences: the sign again, USAF Facility, fronted by a little table and a bicycle, a pair of sandals and a folding chair. As though the sign hung on a kitchen wall, God Bless This Home. At the stoplight I cross to Road Station Kadena, which is in its way as “tacit” as the farms are. Road stations are what Okinawa’s expressway rest stops are called. This is not one. 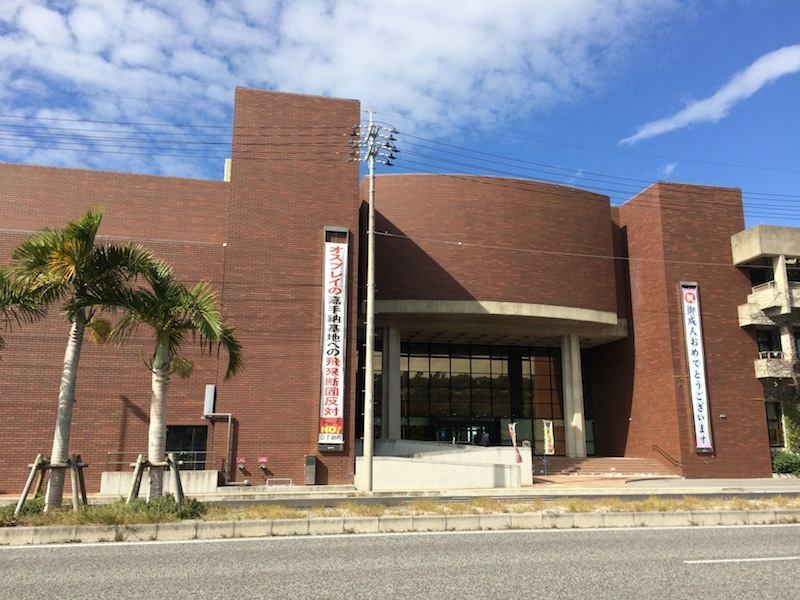 It’s a museum and an observation deck, and it’s another sign of Kadena Town’s resistance to the military presence. On base, people call it “Spy Hill.” It was built ten years ago, four floors at the corner of the flight line and positioned for the best view. There are four live feeds in its museum, on the wall facing the runways. Each camera is positioned on the building’s roof to capture a different angle, so that together the four screens make a full sweep. The planes onscreen are very small. The cameras catch movement, but little detail. That’s left to the photographers who wait upstairs on the observation deck with their foot-long lenses and their tripods, eating chips at the media-only table as buses full of mainland tourists disembark downstairs and come up to cluster at the deck’s best view. The planes approach from so far away I can’t see them, but the photographers know where they’ll be before any of us hear them. They move to the best viewpoints and aim their cameras. I follow them, and lo, there is a pair of F-15s coming in to land. The Road Station tracks the radio traffic, too, noting any time a distress call is sent out. These are collected and reported, an explicit tally of potential damage. 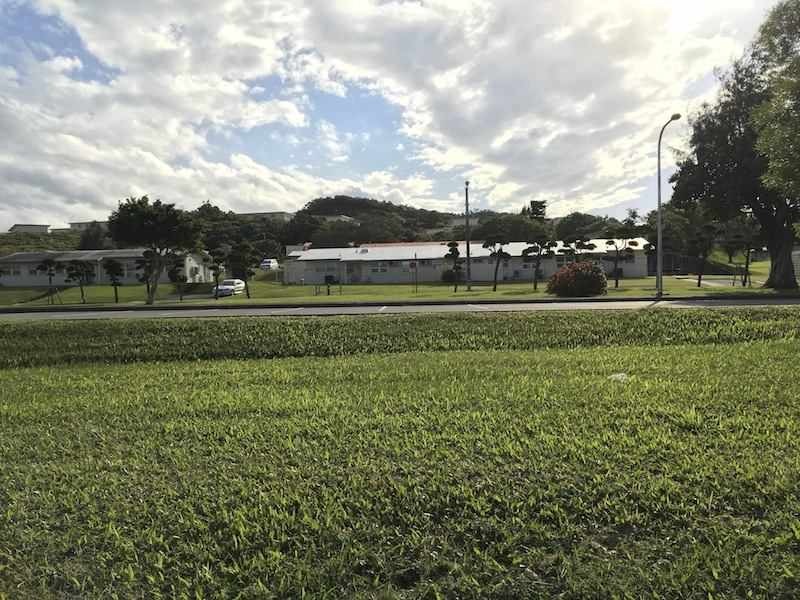 That tally is one reason it makes sense for Japan to regularly increase rent payments to landowners: it’s a running calculation of the risk run by Kadena Town and its residents, the risk of another crash like the F-100 in Ishikawa in 1959, which killed eleven students when it crashed into their school. The tally is an actuarial table, and the payments are insurance. 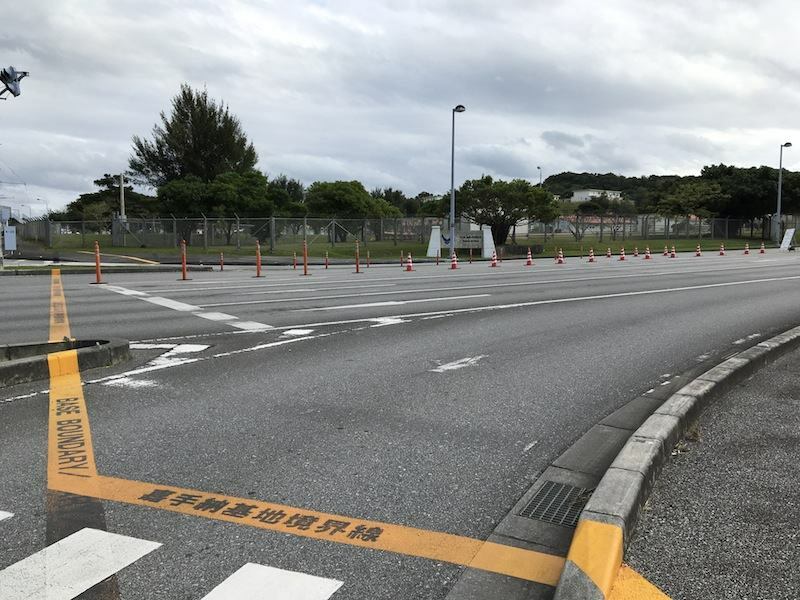 Past Road Station Kadena there are more farms, more pedestrian gates, some grown over and some cleared. 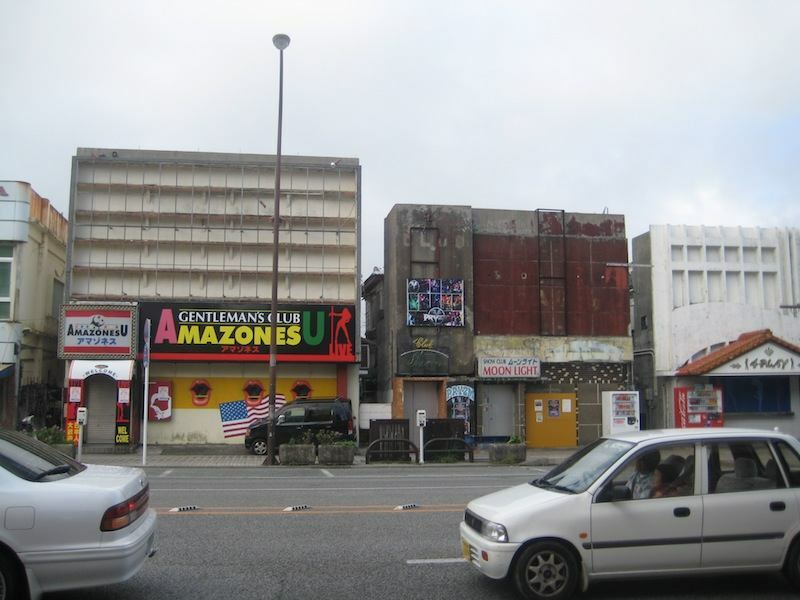 This is the land most like the museum’s 3-D model of Kadena Town before the American invasion. Rip up the tarmac, and in days you could have farms here, watered by the river which now runs carefully around the runways in drainage pipes and ditches. 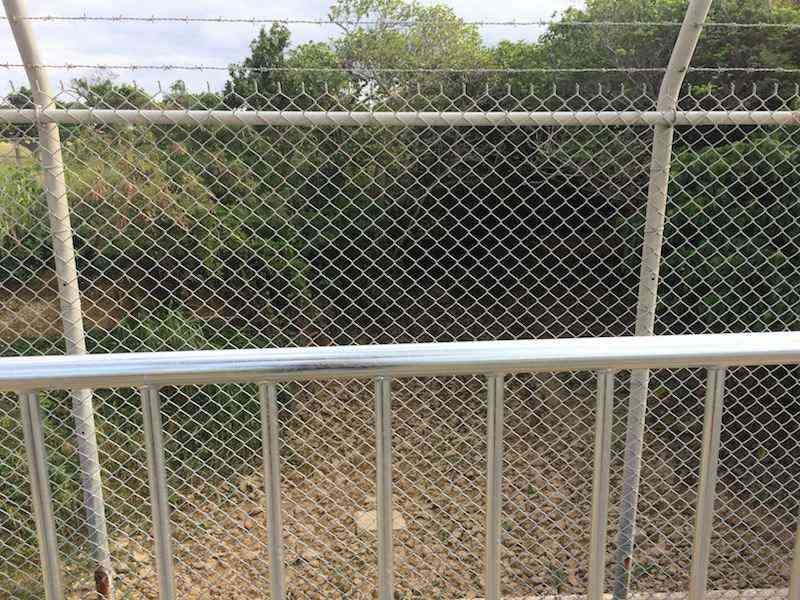 In a tunnel beneath my sidewalk, instead of a river there runs another road, connecting the main base with the munitions storage across the highway. The hills stretch for miles, and beneath those hills are bunkers where nuclear warheads slept all through the Cold War, when the island had no nukes officially. All that’s visible on that side is fence and thick trees. On the main base side, though, you can see everything. The fence is bare and the landing strip extends before me, empty. A sign is posted on the fence in Japanese, with cartoon drawings. One drawing warns against kite-flying with an image of a helicopter’s blades tangling a stick-figure’s kite, all helpless strings and paper. Which first makes me laugh, and then I find it terrifying. When the highway splits some meters later, the view clots up with trees and eager grasses, and dusty benches line the median. I walk along the base fence at the turnoff and what I find is lots of trash. An old refrigerator, a loveseat, milk crates, like I might find on a walk back home in Texas. Then the vegetation thins and here is a secret gate, old pavement beneath it, hangars close on the other side. 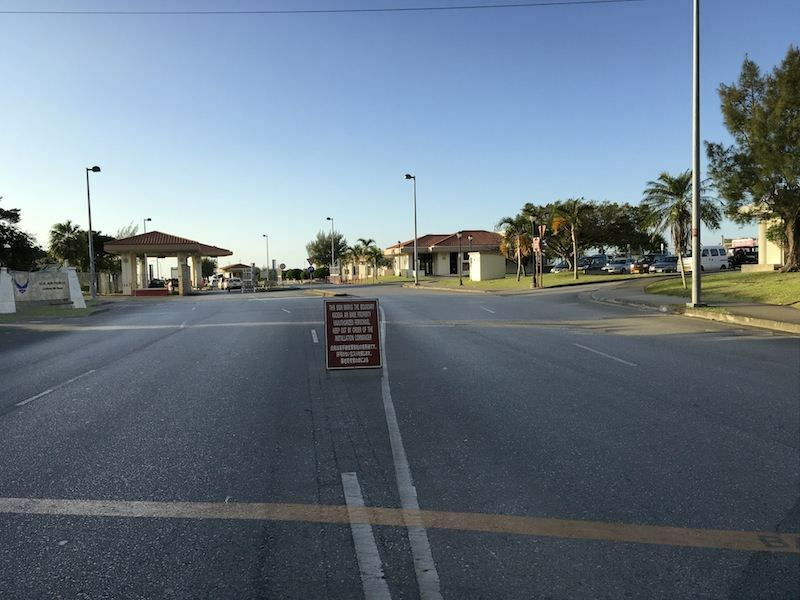 At one point the road on base must have extended through the gate and to the off-base highway, or beyond it. But now this little corner of the base is made of fences branching off in several directions, fencing this exit and a little road running to the south, so much fence and all of it rusting. In the center, a clearing where no one can see me, a little pocket of private observation. 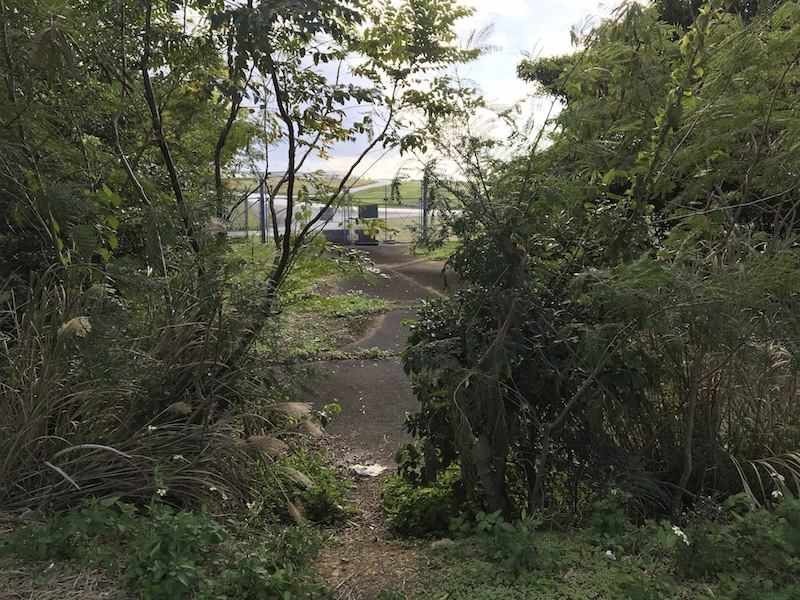 Not entirely private; there is someone in a white car parked just past the clearing, and as I walk back to the sidewalk I make up reasons why I’m here: documenting the dumping site, documenting vegetation, marking where to mow. But no one gets out of the car, no one asks me for my stories. 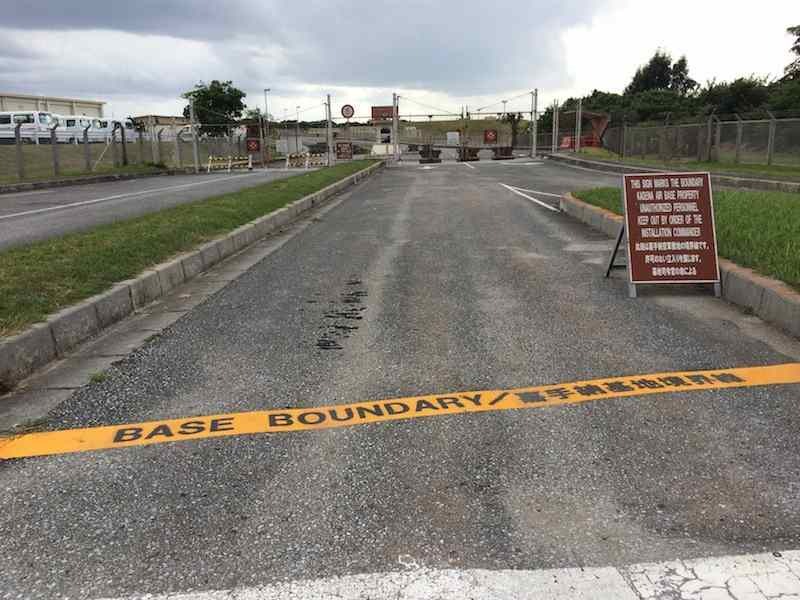 Yesterday I sat in my car across from this gate, pointing toward the base, aimed at it, my little car no kind of weapon except in its alliance with the jets overhead, using fuel the same as they do. Now the only noise is traffic as it moves and stops for the light in front of me and moves again. No planes. I’ll keep hearing jets for days in everything, in motorcycles, in accelerating traffic, in what turns out to be an early morning rain, then in my rented apartment’s glowing nightlight which makes wave sounds. When it’s a real jet, and I look up and see it, I think of money. The sound I hear is thousands of dollars catching fire as the plane rips through the sky. And I remember I pay for all of this, these are my taxes I hear burning. I wonder what fraction of that shredding sound is mine. The gate has the same orange stripe and sign as Gate Four’s, except Gate Three’s stripe has been repainted. The first go was a mistake: blacked out, it runs across the crosswalk whose stripes have been repainted over the error. The rest of the intersection’s white lines are so faded they could have been last painted when I lived here, more than twenty years ago in our first on-base house. I can see its neighbor houses, and then my house itself, its front door, a Playskool plastic car on its front stoop. It didn’t used to be so clear a view from here. There were houses across our street, but then the base razed the full row which backed up to the fence and highway. For visibility, I heard, and heard, too, that there’s a new rule about landscaping. No hedges above the windowsills, no windows blocked by trees. Is that about seeing in or seeing out, I wonder. About cleanliness, what it cloaks. I think again of the auditorium and the vice principal’s clean-shaven face. Now that the razed houses have left the sight lines open, I can stand across the highway and look directly in. If it were dusk, I could see into my house’s windows to where we had the TV and the kitchen table. And then the hill begins to rise and I won’t see anything for more than a mile as the expressway becomes the boundary. 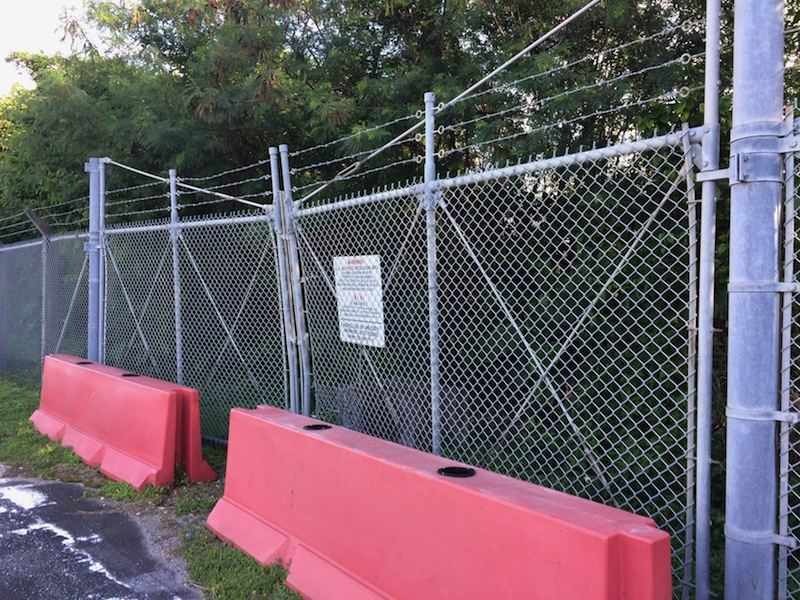 Still the same style of barbed-wire fence, but this one guarding commercial property, the base itself invisible. 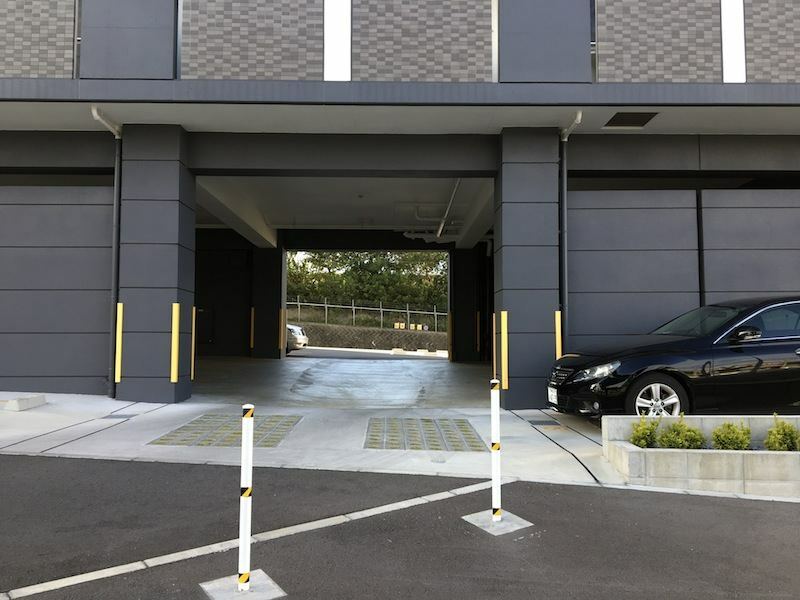 But then here is Bharwani House, whose ground-floor carport is full of US plates, whose entrance has a two-foot Statue of Liberty mounted above its awning. The neighbor building is called Hawk City, followed by a church, Calvary International, whose worship services are listed in English only. The base is not invisible. It’s here in its proxies. Gate Two is the famous gate, the one which opens to the famous street of entertainment. Its name is Kūkō Dori, Airport Street, and it’s still lined with bars and tailor shops even though they’re no longer well-kept-up. I used to know the next street over better, Chuo Park Avenue, whose ground-floor shops sold CDs and stationery and magazines, and whose restaurants showcased plastic food on glassed-in shelves. The upstairs rooms were strip joints, photos of the women working pasted above the restaurant’s display cases. Four years ago I had a drink in that now-empty shopping row, at a pizza place owned by an ex-Marine. He was, he said, on his third wife, all Okinawan. He complained about the woman mayor who had wanted to clean things up and ruined everybody’s business. But it had worked, the cleaning up, he said, that and the curfew. The strip clubs now were stateside-style, conventional, not like they used to be. How was that, I’d asked him. He said, “You couldn’t fathom unless you’ve been to the Philippines or Thailand.” The women in the photos nearly thirty years ago had been Thai and Filipina. They still are, though the ex-Marine told me now some are Eastern European. The Admiral resigned; the bases had a curfew for several months. Then the curfew lifted, and then it went back into effect, as it has each time there’s been a major crime. Just last year a Navy sailor raped a mainland tourist in a hotel, and an ex-Marine contractor stabbed a woman to death. For months, the teacher I talked to told me, no one was allowed to drink off base, or stay off past 10PM. But local businesses were glad, he said, when the curfew lifted. I can see the fence again, finally, through the construction past the gate, under the expressway’s flyovers. It’s a clear line dividing off-base from on-, Okinawan from American soil, we say as we soil them both. The barrels they found were here, yards from my elementary school, which I can see when I push my camera through the green construction gauze guarding the barrel site from view. Dozens were tested and all three of Agent Orange’s components were found, though, like the nukes, herbicide storage was never officially admitted. In sixth grade we were supposed to walk the long way to school, along the avenues with crossing guards, but I and most other kids preferred the valley shortcut through the jungle where vines hung low and thick enough to swing from, where snakes lay waiting, where any snap or movement in the brush would set us running. I thrilled at entering and then escaping wilderness, shrieking up the ramp to school. If I’d stayed in the valley a few more yards I’d have made it to the barrels and breathed dioxin, could have taken it to school with me on my jeans and socks and my mosquito-bitten neck. My mother’s cancer preceded our move to Okinawa so the barrels, close as they were, were not at fault. But our third year there she had a scare. We flew to Hawai‘i’s Hickam AFB whose hospital was first-rate, they said, and where I collected all the paper slippers the nurses would let me keep. I loved them. That same year a classmate of mine flew back for a better hospital but his was San Antonio’s, whose burn unit was best. He’d been huffing spraypaint in a cave with friends when one lit a cigarette. He had been popular; I remember wishing someone had invited me, until he came back wearing what looked like pantyhose over his face to shield his new skin from the air. That cave was near to where the US soldiers landed in the war, and would have been a sanctuary. People would have hidden there, and people would have died. My classmate’s fire was not the worst the cave had seen. Gate Five is the one gate out of number order. Perhaps it was created later, cut into the seamless fence. Past the filled-in high school pool, I can’t see the parking lot but I know it’s still there, still stenciled “seniors,” and I am there, sixth grade, riding my slow bicycle around in circles in the hour between when my mother’s first-period class began and my school opened. I stayed on the sidewalks, afraid of the late-arriving seniors in their cars. In mornings after rain, snails littered the ground. I tried only half-heartedly to avoid crunching through their shells. Those were mornings we’d have woken in the dark inside our first house. My room smelled like wet wood, its closet doors closed over hand-me-downs my aunt had sent: a strange pair of culottes sashed at the knee, with a satin ribbon down the side. I looked at the tag. It said Yves Saint Laurent, which I knew meant money. The pants were already too small for me and had come with a long-sleeved high-necked pink blouse with black swiss dots. Who wore that? Who bought that for their daughter? My aunt, who was trying to prove something in Lafayette, Louisiana, where nobody wore those clothes either. Her husband was in oil. I kept those clothes for what I thought they meant my family was. And because I knew to save good clothes because someday you might be smaller. The first summer we went back to Texas, my grandfather warned me to be careful lest I get fat thighs like your mother’s. Past the gate there is another strip of fenced farm, labeled Other on the map. A kind of no-man’s-land, one whose name frames it as surely as the fence does. No highway runs along it, but rather the backs of houses, a narrow corridor of mown grass between the fence and a retaining wall. As I reach the last of the stone steps down to its gate, I’m greeted by the first person I’ve talked to all day: a man, just getting there himself, and I’ve surprised him. He asks if I have ID, and holds the gate open a little, its USAF facility sign right at face height. I say no, I am just visiting, and he comes out to talk to me, closing the gate behind him. He says he worked on base for 20 years, building F-15 engines. He is retired and now he gardens. Do I garden? No, I say, then awkwardly, but I wish I did. I mean I wish I could go in, could stand in the middle of the growing garden, that strange borderland of base ground turned against the base’s other uses. But I’m also wary of my desire to enter, wary of what kind of pass I would be asking for. And, too, I think the garden is another kind of golf course, gated, a privilege extended to whom and how I don’t know. He waves me on and I stand in the strip of grass between the retaining wall and fence. I can’t see the far edge of the garden; there are too many fruit trees and their leaves are thick. On my side of the fence the path inclines a few yards, and then at the top of the little hill is the street again, where I find another garden, outside the fence, just as lush as the fenced-off one. And a car, parked, with someone in it. I didn’t realize I had a photo of Shima until I looked back through, and there she is, leaning out of her car to see what I’m doing, just before she gets out and says hello and offers me her flowers if I’d like some, if they’re what I’m looking at. Hot pink with yellow centers. They’re beautiful, I say. She says she used to work on base, pointing, as the gatekeeper did not ten minutes ago, across the fence. She was a beautician for forty-five years at the Exchange. She retired last year, she says. Which means, I think to myself, she’d been working there more than a decade when I came thirty years ago. 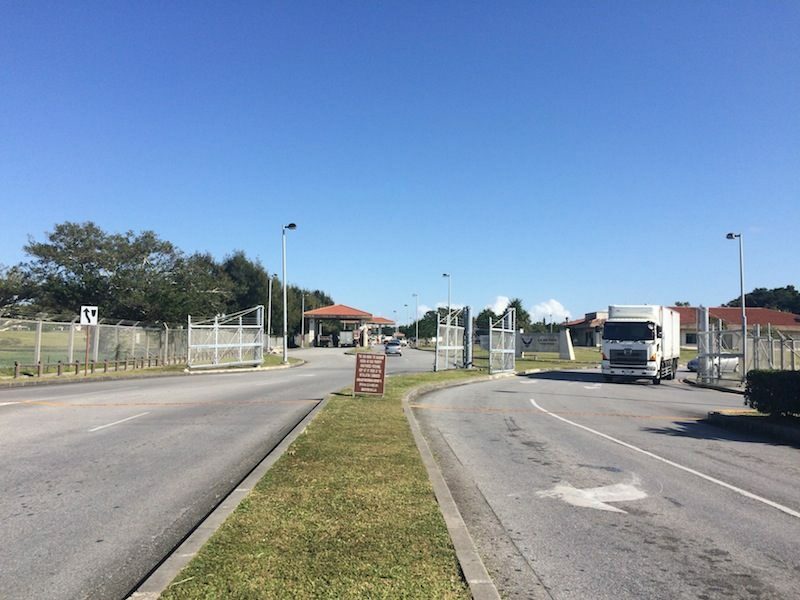 And also means we spent seven years going in and out of gates, living, breathing on the base at the same time. She’s 75, she has five children, fifteen grandchildren, all of them on the island except one in college in the US. Are you married? she asks. Yes. Do you have children? No. I’m reaching the age where people’s faces change when I say that. Until now they’ve been open, I’m young enough children can still happen. But recently I’ve watched people decide how to follow up. Shima nods. You should, she says. I’m lucky mine are here with me. How I got to be three weeks from forty without my mother I don’t know. Every so often, it strikes me. She made it ten days past my 29th birthday, which means that every time I celebrate, I am already mourning. This year, I am closer than I’ve ever been to wanting children, but having them is also newly frightening, this year of our new president. If Shima is 75, she was born into the war, was four when US soldiers landed. My mother, who would be 72 were she alive, was born into the same and not the same war as Shima’s. How had their mothers felt? What had they imagined, looking forward? I find my manners and introduce myself. I don’t know, I say, about the children. She says you have time, which I’ve heard before. I could as well be talking to one of my older cousins, my boss, a nosy friend. I had thought of myself, walking around the base, as doing something public but doing it alone. Encountering the gatekeeper and then Shima, I feel as I always do with friendly strangers, flustered and interrupted, as though the most important thing is to keep to my preset purpose. As I walk from her, I am close to the houses, close enough to brush the potted plants lining their windows. But this is not my neighborhood, this is not quite public space. These are someone else’s privacies, surrounding and separate from my own. Until they give out and there is only fence on one side, blank grassy park on the other, and then businesses. Tire shop, pet shop, housing agency. Here is the Eagle Lodge where military families stay, waiting for on-base placement. Across the street is what used to be another lodge, on what was base land but was returned nearly twenty years ago. It’s being developed only now because it took so long to clear the ground. 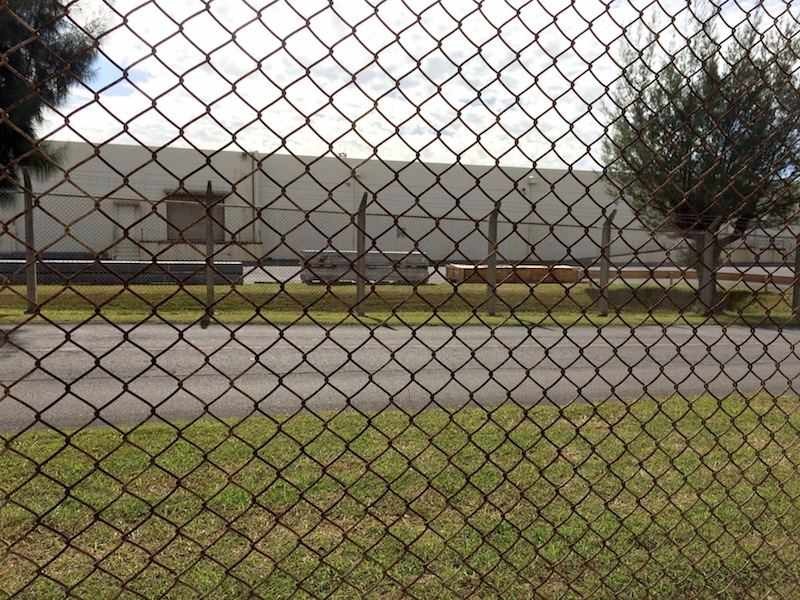 Construction crews found ammunition, explosives, leftovers no one knew about. Or said they knew about. Barrels, bombs—is there ruin under all this ground? Beneath me, beneath the fenced-off farms, beneath the chickens. I’m nearly back to where I started. I can see the house roofs on base, can see Gate One, the golf course again, and as I approach, here is another stranger, though one I have been half-expecting this whole time. “Ma’am,” he says as I take a last photo of the golf course view. “Ma’am, what are you doing. You can’t be taking pictures, I need you to stop.” He is maybe twenty, in olive camouflage, and he has walked all the way out to the orange line to meet me without my noticing. It has felt good to think I am transforming the base in some way by circumnavigating it, by attending to its edge so closely. I want to think of it as a kind of labor, one foot after another. What it is is luxury, the luxury to fly here, stay here, walk on my own two legs for two days around a fence and have no one stop me. Until the end, when I am stopped, and even this is luxury, to be approached by a man with an automatic rifle and not be frightened of him, to trust I will be recognized as an American, as a white citizen, as a woman face to face with military chivalry. I am produced as innocent by all my categories which are immediately legible. Less legible: that I’m a poet working on a manuscript, which I tell him before I realize it’s not a good idea. He hedges, is uncertain. It’s probably illegal to take those photographs, he says, almost definitely it’s illegal. He calls someone else over because, he says, he’s Navy security, this is a new post, he doesn’t know Air Force policy. The Air Force gate guard also treats me like I’m no risk. Hello, he says, genuinely. I went to high school here, I tell them. Everything looks different now. That’s true and not true; the gatehouses are bigger than they were, but the rest is all the same. My new schtick about nostalgia works, though, and they are relieved to have something easy to tell whoever’s listening at the other end of the radio. The Air Force gate guard would have just let it go, he says, as they wait for further instructions. You know, they’ve got to make sure you’re working, can’t just let you sit down, he says to the Navy MP. They take down my passport number and my name, and my phone number too in Hong Kong though I tell them they can’t reach me there until tomorrow. Each of these men, as small a part of the machine as I was. I wonder what kind of list I’m on now. Perhaps no list at all, just my information quiet in a record book of this month’s interactions. The base is a blend, now as when I lived there, of security theater and a hubristic assumption of total safety. Threatcon levels are announced each day (Normal, Alpha, Beta, Charlie), blustery signs proclaim US jurisdiction along the fence every several hundred feet. 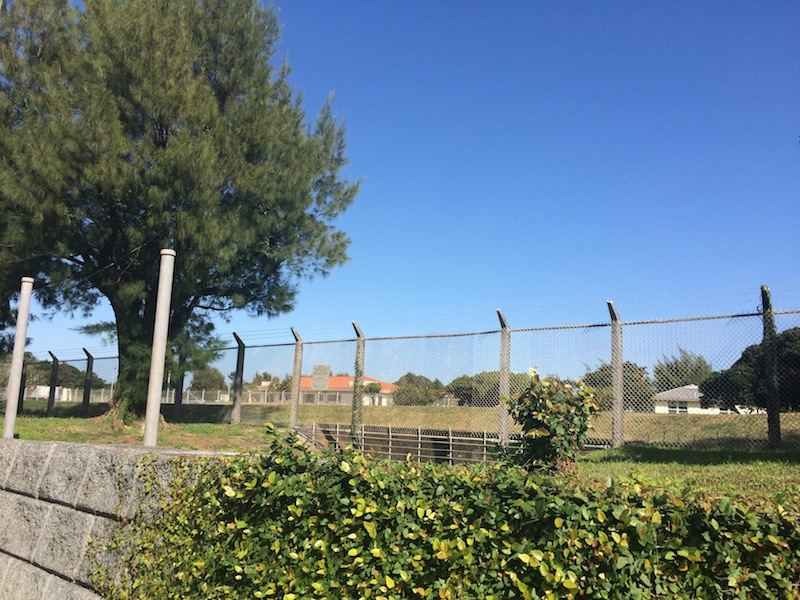 But there is also a sense that no one will mean harm—so much vulnerable equipment in view behind the chainlink, and the elementary schools visible, too, the field on which we had field day. All the farmers granted access, gatekeeping each other. And me. Every authority has been so easily persuaded I mean no harm. I suppose I don’t. Or at least, I have very little capacity to cause it. What I wish harm to is the national sense that we belong here, and the reasoning undergirding it: that because it would be so complex for the base to leave, it must instead inevitably stay. In my walk, I have broken down the base’s permanence into more than two thousand photographs, at 30-foot intervals. I have charted its little details, what’s eroding, the water’s entrances and exits, how carefully or not the fence is tended. What I see is that the base is as permeable as it is permanent. And that while the base fence most often yields a clear view in, sometimes it doesn’t. Sometimes the view is this instead. 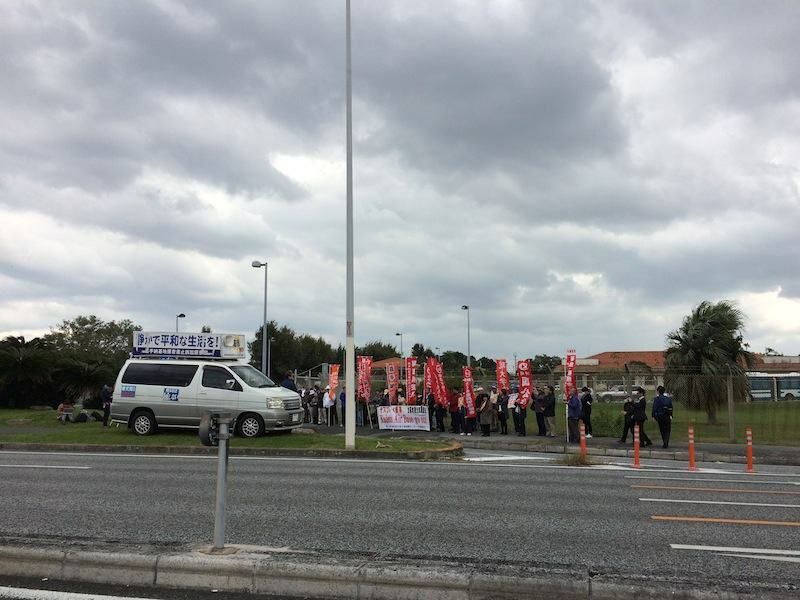 The sign reads "Kadena Air Base Go Out." Anti-base protest Friday, December 16, 2017. 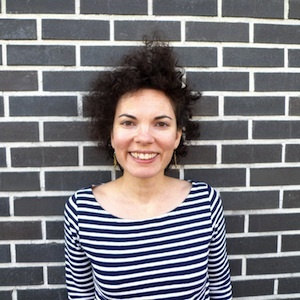 Collier Nogues is the author of two books of poetry, The Ground I Stand On Is Not My Ground (Drunken Boat, 2015) and On the Other Side, Blue (Four Way, 2011). She is a PhD Fellow at the University of Hong Kong, where she studies contemporary poetry’s response to US militarization. 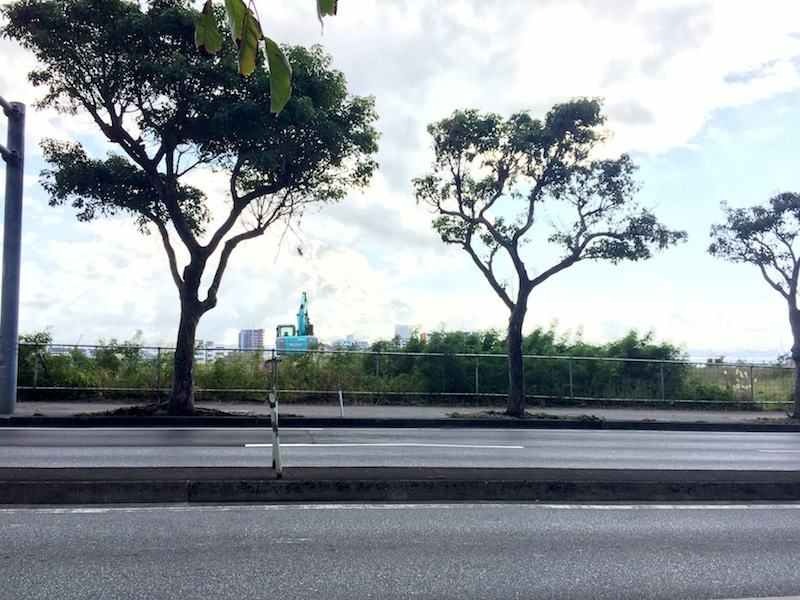 I live in Hong Kong, whose military installations have been occupied by the British Forces Overseas Hong Kong (including British, Indian, and Canadian infantries), the Imperial Japanese Army, and now the People's Liberation Army of China.